As has been my tradition, in December I repost old favourites from years gone by. This year am looking back to 2014 and this piece on juice. Juice is an incredibly frustrating beverage. Despite packing the same caloric and sugary punch of Coca-Cola, unlike sugared soda, juice's undeserved health halo regularly leads to its provision, consumption (and often over consumption) in the name of nutrition - especially to and by our children. And kids really shouldn't be drinking the stuff, or at the very least, not in the name of health. The Canadian Pediatric Society and the American Academy of Pediatrics both recommend that juice be capped for kids at half a cup daily. And make no mistake, the capping isn't because juice is so damn good for the kids that we don't want them to drink too much of it, but rather because every glass contains 5 teaspoons of sugar (or more) and calories which won't be compensated for with decreased portions at their next meals. The World Health Organization also considers juice to be nothing more than a sugar delivery vehicle and in their recent draft guidelines on sugar consumption specifically call out juice as a source of undesirable free sugars. Yet there's this piece that came across my Newswire just last week. 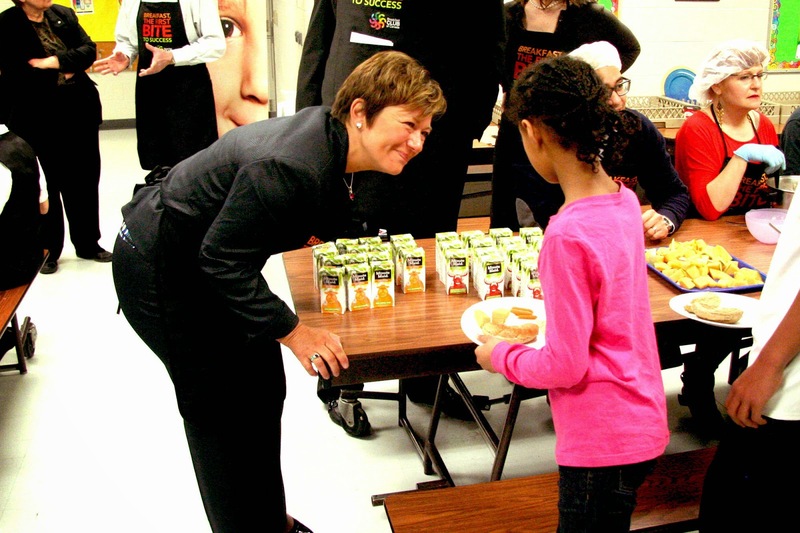 It was a press release put out by Coca-Cola (makers of Minute Maid) and Breakfast Club of Canada and it featured Teresa Piruzza, MPP for Windsor West and Minister of Children and Youth Services launching the newest Ontario Breakfast Club, which judging from the press photo up above involves the indoctrination of children into believing that fruit juice is a healthy part of their breakfast and the provision of juice boxes (containing more juice than our experts' daily recommended maximum), festooned with cartoon characters that in turn might further increase a child's consumption and desire for same. Can you imagine a similar scene with the Minister of Children and Youth Services grinning and handing out Vitamin C fortified soda, in cartoon covered cans, to children in the name of breakfast? "Breakfast Club of Canada supports healthy breakfast programs at 1,266 schools, supporting nearly 130,000 children and serves close to 21 million breakfasts every year and that Minute Maid® has partnered with Breakfast Club of Canada since 2003, donating Minute Maid® juices to support programs across Canada." Breakfast I'm all for, but marketing sugar water to children and washing it in BS "corporate social responsibility", food insecurity, and health, is incredibly misguided, and incredibly sad.